Cori has a bit of a gnome obsession. Growing up, Swedish Tomte were very prevalent in Cori’s house, especially at Christmas time. At the celebration of St. Lucia, small children would dress as tomte and carry lanterns to light the way. Cori says: This is a song we’d sing at Christmas time. The translation seems to be more about elves, but I think about the tomtes tippy-toe-ing around, helping St. Nick with the presents. 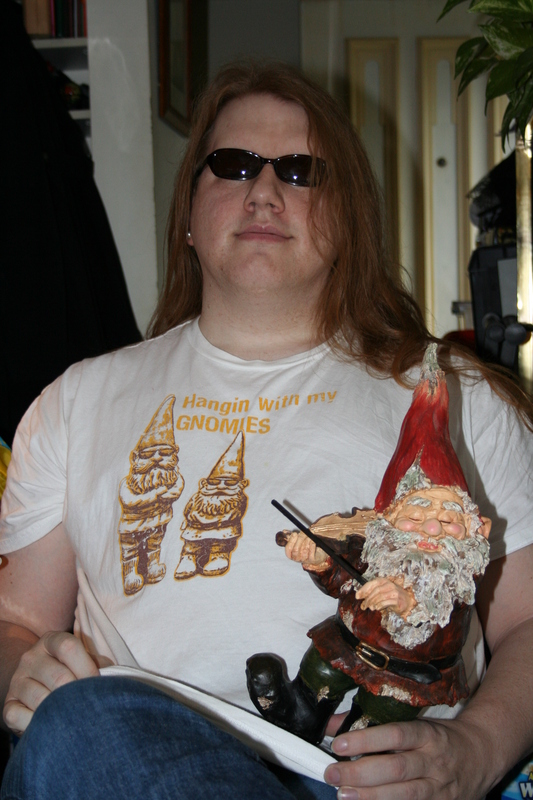 Cori exclaims: A gnome fiddler is the epitome of cool! This shirt also reminds Cori of the scene in Clueless where Brittany Murphy’s character is dancing to “Rollin’ with the homies.” Rest in Peace, Tai. The shirt most likely came from Kmart. In celebrating our 50 previous shirts, we’re still collecting comments about which one is your favorite, dear reader! We have just one comment so far.